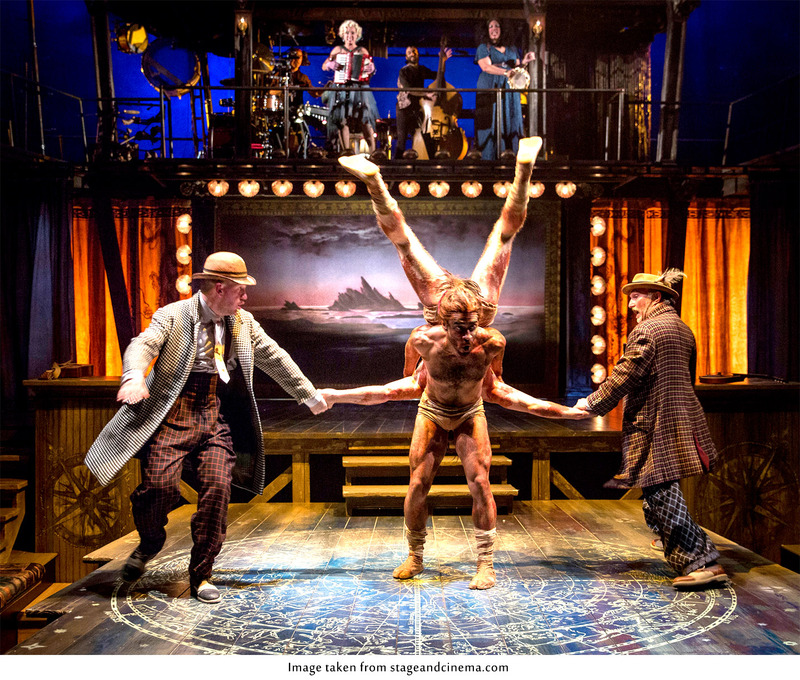 The most memorizing moment in Chicago Shakespeare’s production of The Tempest is not based on slight-of-hand or misdirection or characters appearing out of thin air and then disappearing just as quickly. These moments are spectacular, particularly from my “ringside” seat two feet below the action, but the greatest moment involves Larry Yando’s Prospero owning one of Shakespeare’s great monologues halfway through the final act. With no tricks beyond diction and intonation, Yando explores Prospero’s character as he transcends beyond his vengeance for those who wronged him 12 years prior – those who removed him from his dukedom and attempted to leave him and his three-year-old daughter Miranda drowned in the vast ocean. Prospero corrects the wrongs of his entire world without shedding any blood. Perhaps Shakespeare was growing soft in The Tempest, which is credited as the last play he wrote without collaboration. 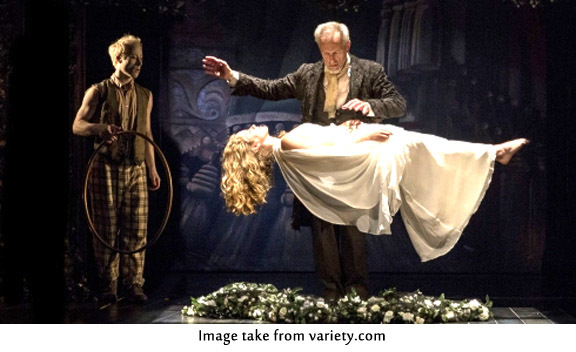 The concept behind this production (originated in Las Vegas and moved to Los Angeles before arriving in Chicago) is focused on using illusions to explore Prospero’s island, which is a lively funhouse of magical feats. Co-directors Aaron Posner and Teller (of the magic duo Penn and Teller) begin with pre-show antics as Ariel (Nate Dendy) silently performs card tricks with audience interaction. Other magical highlights designed by Johnny Thompson include Miranda (Eva Louise Balistrieri) floating in space as part of her wedding to Ferdinand (Luigi Sottile) and mystical-servant Ariel being twisted into a knot as a reminder of the torture from which Prospero saved him. The most enduring visual decision comes from using two actors to perform the monster Caliban, the island’s supernatural antagonist. Zach Eisenstat and Manelich Minniefee perform acrobatics as this two-headed, four-legged Caliban pulsates in every direction while remaining conjoined by touching body parts. This approach adds some balance to the great flaw in The Tempest’s script, which is the over-long scenes involving Caliban and shipwrecked fools Stephano (Ron E. Rains) and Trinculo (Adam Wesley Brown) as they muddle through a suspense-less assassination attempt on Prospero. The Tempest stands among Shakespeare’s best for many fans. For me, its strengths are the backstory scene in the first act and character development of the fifth act. The middle three acts meander among eight shipwrecked characters that have little to do beyond act surprised by the magical events that control their lives. The antagonists have no powers to confront Prospero, and thus the play revolves around one-sided battles that end only once Prospero has blown off some steam. As productions of The Tempest go, the bar is now set high for future productions to explore new depths of imagination within Shakespeare’s most magical play.